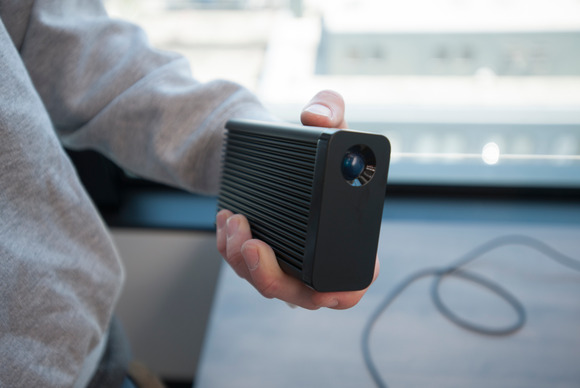 You can hold the Little Big Disk Thunderbolt 2 easily in your hand. 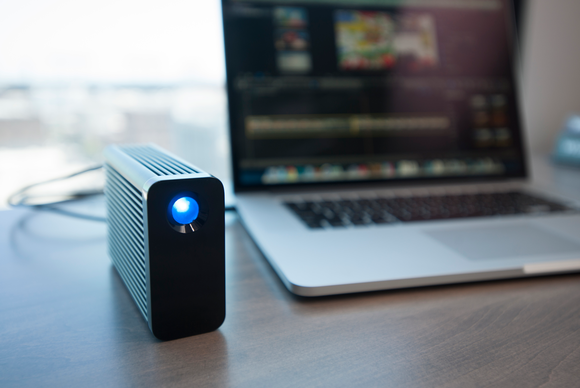 The Little Big Disk Thunderbolt 2 is the latest in desktop storage from LaCie. Inside the sleek black enclosure are two "blade" style PCIe SSDs that LaCie configures in a software RAID 0 to maximize the drive's speed and storage capacity. Past Little Big Disk models featured 2.5-inch laptop drives, but these newer SSD modules connected to the PCIe bus allows speeds faster than SATA III. The blue "eye" glows when the drive is in use and goes dark when the drive is asleep. Black enclosure aside, the changes to the chassis are quite subtle. The rear vents are slightly different, and the position of the small internal fan has changed. 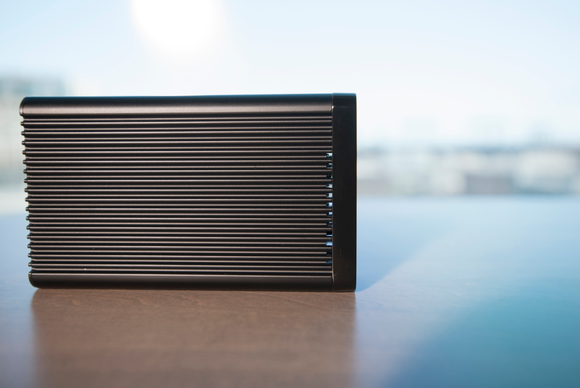 LaCie also added some difficult-to-notice new vents near the front of the drive to allow better airflow. The drive gets warm but not hot, and is whisper silent during operation. The addition of some subtle new vents in the front are difficult to notice except from the right angle. Take a look around the back and you'll find two Thunderbolt 2 ports for daisy chaining devices. If you have other Thunderbolt 2 devices, make sure to keep them at the front of the chain to get the maximum performance. 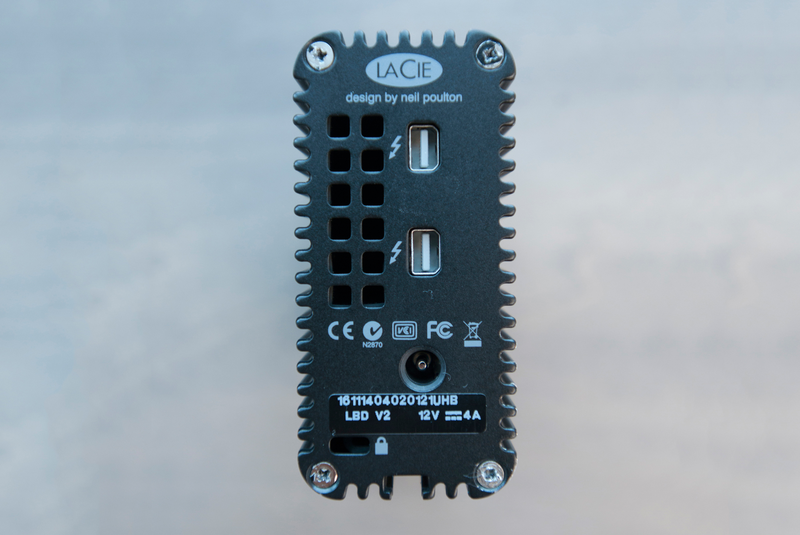 Legacy Thunderbolt devices can be added to the end of the chain. A slightly new vent arrangement in the back, but otherwise everything is pretty much the same. The Little Big Disk Thunderbolt 2 reads and writes like a real pro, and outpaces other desktop RAID solutions featuring up to six mechanical drives. Having fewer parts also means there's less of a chance that a drive could fail and disable your RAID 0. The numbers speak for themselves; the Little Big Disk with Thunderbolt 2 easily outperformed what were previously our fastest drives. We ran AJA System Test, to measure the drive performance when dealing with 4K footage at a resolution of 3840x2160 with a file size of 16GB. As suspected, it's fast. The PCIe SSDs help to make the drive small and light, especially for a desktop drive. Standing alone without the stand, the Little Big Disk Thunderbolt 2 weighs only 1.3 pounds, but when you include the charger and Thunderbolt cable the weight totals 1.9 pounds. Overall, the drive is about a tenth of a pound lighter than previous models. This is all without the little stand you can optionally attach to the bottom of the drive. The Little Big Disk Thunderbolt 2 isn't a portable drive per se, but I was easily able to grab everything needed with one hand. Lugging around a power brick may be annoying, but the Little Big Disk Thunderbolt 2 is about the most portable desktop drive we've tested. It's not meant to carry movies with you to a friends house—though it could, of course. 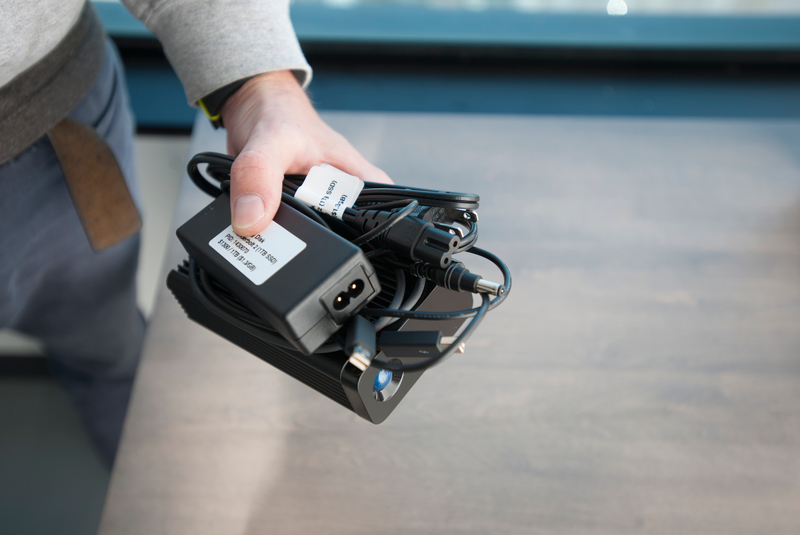 The drive is targeted at video professionals who can take their projects with them on the road with much less effort than an enclosure with six 3.5-inch drives. The downside of using SSDs is that you don't get the massive capacity that comes with using larger 3.5-inch drives and the price per gigabyte is much higher. Selling a terabyte drive for $1300 is bold, but dangit if it ain't the fastest terabyte you done ever did see so far. The Little Big Disk Thunderbolt 2 is really an investment for the most demanding users who want the fastest transfer speeds available in an easily movable package. If you need more space, you can daisy chain a few Little Big Disks together, but you'd be better off looking at a desktop solution like LaCie's 5big, OWC's ThunderBay IV, or the Pegasus R6 from Promise.